Nothing is more important to us than having you at KGM World Connect 2018, August 29-31, 2018, at the beautiful Westin Galleria, in Dallas, TX. Would you please consider this a priority? Everything we do is based on relationships. To me you’re not a conference constituent, you’re a member of our family. We love you as a family member. We cherish our times together. This is more a family reunion than it is a conference. We just happen to have global leaders in our family that are shaking the world for Jesus. Our theme this year is “Ask”. "Ask of me and I will give you nations..." based on Psalm 2:8. We will be having a lot of prayer and intercession for nations. We will also have fellowship, worship and powerful teaching by Davi Passamani, Valson Abraham, Frank Aikins, and Devi & Larry Titus. The worship will be led by Ana Paula Bessa, Julissa Rivera, and Fernando Alvarez. Please write this on your calendars now. We really, really, really want you there. We have a big family and I want all of our kids around our Kingdom table. KGM World Connect will be held at The Westin Galleria Dallas. Enjoy great lodging and shopping in the same location! The Westin Galleria Dallas is adjoined to the renowned Galleria Mall. Dallas is known to offer some of the best shopping malls in the United States. We intentionally choose hotel sites such as this so you can maximize the use of your leisure time. We have a special rate to offer our attendees. $155 per night - Rate is per room | Applies for one or two guests in the same room. $180 per night - Rate is per room | Applies for occupancy of three guests in the same room. $205 per night - Rate is per room | Applies for occupancy of four guests in the same room. Rates do not include applicable state and local taxes (currently 13%) and (2%) TPDI assessment recovery fee. An early departure fee of $50 if customer attendee checks out prior to the confirmed check out date. Complimentary self-parking is available for all guests. Cut-off date for group discount is August 6, 2018, or when capacity is reached. Whichever comes first. KGM World Connect 2018 will host our Global Leaders for intensives from August 29th – 31st. The main conference will begin August 29th and will conclude August 31st. The environment will be a massive living room setting where Devi & Larry will do most of the teachings. The worship will be very spontaneous with intense prayer and intercession ministry being a major role in the gathering. **2:30-4:00PM - Afternoon Dessert with Devi and Trina "Ask For Your Generations"
*Schedule is subject to minor time frame adjustments. **Special Program - Tickets sold separately. Kingdom Global Ministries makes tremendous effort to seek sponsors for Global Leaders to attend KGM World Connect. This year, we are looking for individuals and organizations who would like to sponsor Global Leaders to attend KGM World Connect. Full Sponsorship: Provides airline ticket, hotel lodging, meals & registration for a global leader. Cost varies for each Global Leader according to their origin. Full scholarships range from US$5,000-$7,500 per person. Partial Scholarship: Provides hotel lodging, meals & registration for a Global Leader. The average cost for each global leader is $1,800 to $2,000. Registration Only: Provides admission to our KGM Global Leaders training (8/27-8/31/2018) and to KGM World Connect, as well as 3 meals during the week. The cost is $450 per Global Leader. Thank you so much for your interest in registering for KGM World Connect 2018. All registration sales are final & non-refundable. Early and Regular Registration include full admission, welcome reception on Wednesday 8.29.2018, and a banquet meal on Friday 8.31.2018. KGM World Connect 2018 Registration is CLOSED. Afternoon Dessert with Devi and Trina is still available. Who should attend KGM World Connect? Kingdom-minded individuals who are involved in activities that advance the Kingdom of God through ministries, businesses, arts, and literature. Individuals, couples or groups who are seeking opportunities to connect and get involved with ministries outside the USA. Individuals who seek to sharpen their arrow and adjust their focus so they can achieve greater outcomes. People who want to understand why they do what they do. Individuals who desire spiritual strengthening for their personal mission. 1) Does Kingdom Global Ministries offer childcare during KGM World Connect 2018? No. Unfortunately we are not equipped to provide childcare during the gathering. The environment is not conducive for children to attend, so we kindly ask you make your own sitter arrangements. 2) May I invite others to attend? Yes, you may. However, please keep in mind we want a spirit of unity among the group. It is important all attendees have a Kingdom-minded mentality. It is not required for attendees to be in full-time ministry. We welcome pastors, worship leaders, professionals, business-persons, and any others who want to spiritually grow, and connect with other Kingdom-minded individuals. 3) How do I share the invitation with individuals we want to invite? You may simply send them to this website via www.kingdomglobal.com/kgmworldconnect. 4) Can I register for one or some of the sessions instead of enrolling to the entire program? It is extremely important our guests attend every session of KGM World Connect 2018. Therefore we only offer full admission tickets. 5) I am a ministry ordination candidate on Friday, August 31st, 2018. May I invite family and friends to attend that service? Yes. Friends and family members of ordination candidates are welcome to attend Friday night's service through purchasing banquet tickets for $89 each. 6) Does the hotel or KGM offer transportation to and from DFW airport, or Dallas Love Field airport? No. Guests are responsible for their own transportation to and from the airport. However, if you choose to rent your own vehicle, the hotel offers complimentary self-parking on premise. If you have any questions or need additional information please do not hesitate to contact us. If you can’t attend but would like to donate to Kingdom Global Ministries, your support will go directly to our mission of doing what we do: Connect & Grow People. AFTERNOON DESSERT WITH DEVI TITUS. Real conversations of mothers and daughters from several generations. 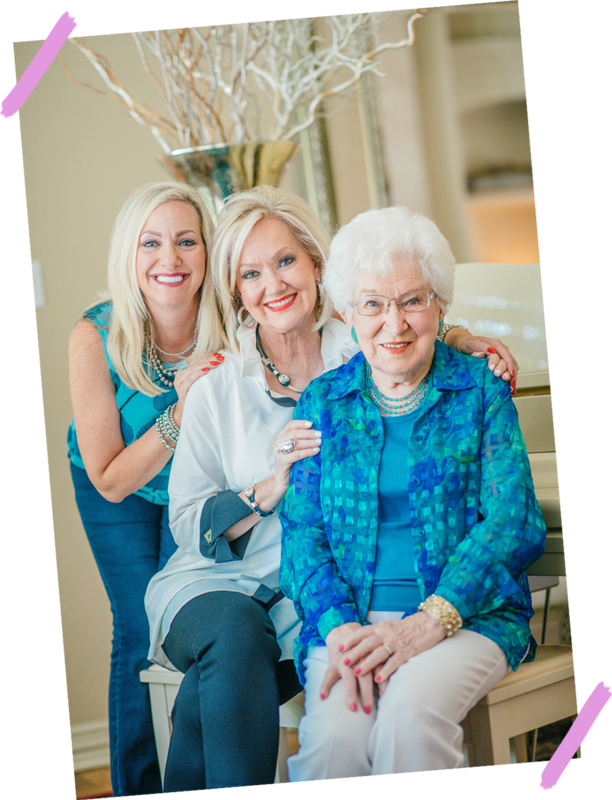 Join Devi Titus, her mother Oleta, and her daughter Trina, for an afternoon dessert themed “ASK FOR YOUR GENERATIONS” where you will hear real conversations about mother/daughter relationships. Thursday - August 30th, 2018 at 2:30pm. Westin Galleria Dallas - 13340 Dallas Pkwy, Dallas, TX 75240. The afternoon dessert will be held during the conference World Connect. If you are registered for World Connect you will need to purchase tickets for the afternoon dessert separately as it is NOT included with World Connect Registration.